Jack Cork is looking forward to celebrating this season’s success with the supporters at Turf Moor when AFC Bournemouth come to town on the final day. The Clarets have enjoyed unprecedented success under Sean Dyche in the modern era, firstly surviving in the Premier League last term and then building significantly to tie up seventh spot in the division. That finish, the club’s highest since 1974, was enough to wrap up European football for Burnley for the first time in 51 years. “It would be nice to finish with a win and a good performance and be able to thank the fans for supporting us throughout a good season,” said the midfielder. 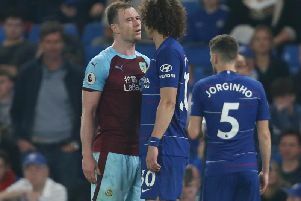 The last time the Clarets kicked a ball in a European competition, they were beaten 2-1 by Eintracht Frankfurt on home soil in the Fairs Cup quarter-final second leg. But that will all change when the club is picked out of the pot on June 19th, with second qualifying rounds scheduled to be played on July 26th and August 2nd. “It’s amazing and everybody is really looking forward to it,” said Cork. “We’ve got the qualifying rounds to get through first, which will be tough, but it’ll be good for the fans to have a few away trips in Europe. Europa League involvement adds another element to what will already be a challenging season, with top flight clubs taking note of Burnley’s growth. However, Cork believes the squad are more than capable of standing up to the task in hand. “We’ve got a great squad with great players and we’ve got more than enough to match any team on our day,” he said. “Next season is going to be tough and teams will take a different approach to playing us. They’ll be expecting more from us so it will be tough.